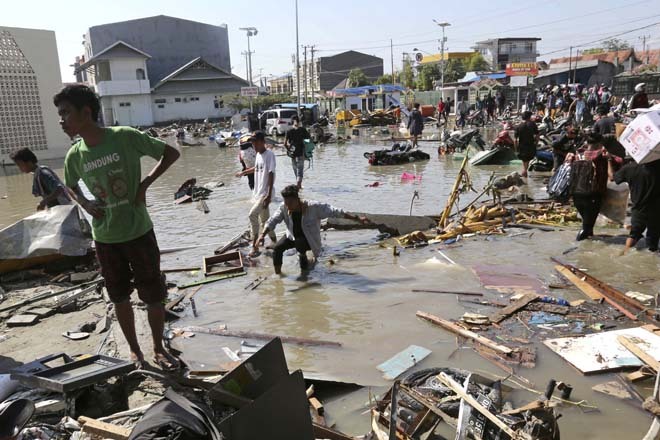 More than 1,400 people died as a result of a powerful earthquake of magnitude 7.5, which “shook up” the Indonesian island of Sulawesi last Friday, and the destructive tsunami that followed it. At least 800 people were injured, according to AccuWeather. Almost all deaths were recorded in the city of Palu, which has a population of over 380,000 people. From Sunday to Monday, for medical and religious reasons, mass graves were held here. Authorities fear that the death toll will continue to grow, as hundreds of people may remain buried under rubble and mud. Rescue work in the disaster area continues. As a result of the disaster, about 62 thousand people remained homeless. A spokesman for the Indonesian Meteorology, Climatology and Geophysics Agency (BMKG) confirmed that a tsunami occurred along the Palu coastline after the earthquake. Waves up to 6 meters high were swept away at home, many families were missing. According to Sutopo Purvo Nugroho, a representative of the National Disaster Management Authority of Indonesia, the Dungala region in the Central Sulawesi province has also suffered significant damage. Aftershocks continue in the region, heightening fears of additional damage to already weakened buildings.